Click “Search” and a page with the results will appear. Review and click through to get more information. You can even request additional search results. 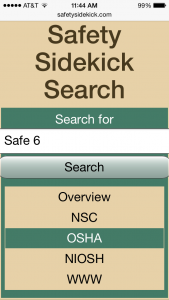 Safety Sidekick Search helps you avoid all the ads and clutter. “SafetySidekick.com” is just one of the efforts we’re undertaking to promote a Safely Working Environment.